The very name tells one something about the qualities of this flavoring, described as having a “bold, peppery“ taste. Most sources (that is, seedsmen’s catalogues) say that summer savory is slightly milder and less “pungent“ than its close cousin, winter savory (which, however, is a perennial); but the authoritative herbalist Gernot Katzer (see the links below) says the tastes of the two are indistinguishable. (It is said that cooks prefer the summer type.) But if we have summer savory available indoors year round, there is really no need for winter savory. The named variety Aromata is reported as having more “essential oils“, and thus to be more intensely flavored, than “common“ summer savory; but it is scarce (we could find none on offer in the U.S.). Few or no other named types seem in evidence. Note: summer-savory seed is short-lived. Always plant with fresh, newly bought seed..
Summer savory is not terribly fussy, but its ideal is a rich, light soil with plenty of moisture and a hot, dry, sunny position. It prefers a slightly alkaline soil, but, again, is not fussy; it is, though, like so many herbs, intolerant of damp soils and of shade. Whether growing it indoors or out, seed it where it is to grow: it violently dislikes being transplanted. Sow seed carefully: just place it on the surface, then gently sift a trace of soil over it to just cover. 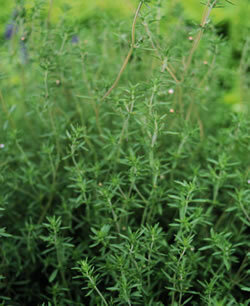 (If being planted outdoors, summer savory can be spaced at 6 inches in a deep-dug bed.) Germination is typically about 2 weeks. Summer savory is a fast-growing plant: it can be harvested within 2 months of sowing. When the plant reaches a reasonable height, pinch off the growing points; that will encourage bushing and increase productivity. If summer savory is cut back as the flower buds appear, it will supposedly produce a fresh flush of leaves. It was last modified on Tuesday, 5 February 2019, at 01:16 EST.